There are some pictures that may take some time to load but the text will be available. Click here For Photos of Marion Ross, his Congrssional Medal of Honor, Headstone and Memorials. While he did not "officially" enter service until August 20. 1861 at Camp Dennison. He was in service for 3 months prior to that at Camp McClelland, Philadelphia, PA according to his own letter from there in May of 1861. You're probably familiar with Antioch's long-standing, peace loving ways. Our students were some of the first to protest Persian Gulf War, the college seriously considered taking an official stand against the Vietnam conflict, and so many Antiochians applied for conscientious objector status in World War II that the FBI took notice. During the American Civil War, however, Antiochians enlisted en masse and the college actually closed in 1863 due in part to the great number of students and faculty who had gone off to war. One of them became celebrated as a war hero and was among the first recipients (although posthumously awarded) of America's highest military decoration, the Congressional Medal of Honor. associated with his schoolmates in play or amusement. care for the active pursuits usually enjoyed by young men." Ross was stationed at Camp Dennison near Cincinnati in the fall of 1861 when his life took a dramatic turn. He impressed the commander, General Ormsby MacKnight Mitchel, who promoted Ross to Sergeant Major and assigned him to the Secret Service (not the snappy-dressing stoics we think of today). His orders were to join a Captain James J. Andrews and 20 other volunteers in Shelbyville, Tennessee for an unknown mission. Andrews, a mysterious figure with no record of his existence prior to 1859, had laid out a daring plan to cut enemy supply lines. They were to travel in separate groups to Marietta, Georgia, over 200 miles behind enemy lines. If questioned, the men were to pass themselves off as Kentuckians, come south to join the Confederacy. They would then steal a northbound train and burn every bridge north to Chattanooga, destroying Confederate supply lines. Andrews reasoned they could make it to Nashville, behind friendly lines, because the subsequent havoc they caused along the way would disrupt enemy communications. The plan was risky, but fairly sound. However, we all know about mice, men, and their best-laid plans. The aforementioned General Mitchel threw a wrench in the works by mounting an offensive outside Chattanooga. The Confederates quickly sent reinforcements by rail. The Confederacy's comparatively few rail lines meant Andrews' proposed escape route would be thick with rebel soldiers. Ross served briefly as the mission's voice of reason, claiming quite correctly that the changing military situation dictated aborting the raid. Nevertheless, they embarked on their fool's errand on the night of April 7, 1862. They arrived in Marietta on the 11th and set the plan in motion the next morning. They boarded a train that first stopped at a place called Big Shanty (now Kennesaw) eight miles up the line. When the crew left the train to take on fuel and eat breakfast, the raiders set about uncoupling the passenger cars from the engine, a now famous locomotive named The General. Before the crew picked up their first cups of coffee, the General and three boxcars roared out of town. It seemed they were on their way, but the engine's fire had been set low for the stop, and soon they slowed to a mere 16 miles an hour, delaying them while they raised a new head of steam. The General's conductor, William Fuller, gave chase on a handcar. He knew he couldn't catch them at the 8 mph clip he was going, but he figured they would be slowed further by the destruction they most certainly wished to cause. 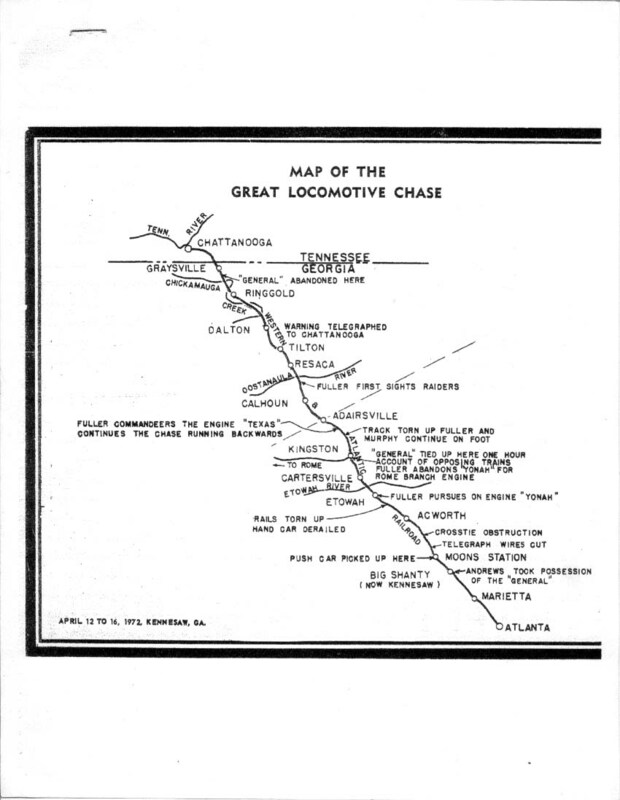 Between that and increased rail traffic caused by Mitchel's attack in Tennessee, Fuller was confident he would catch the miscreants and retrieve his lost locomotive. The raiders lost an hour at Kingston, where the lines were choked with southbound trains. 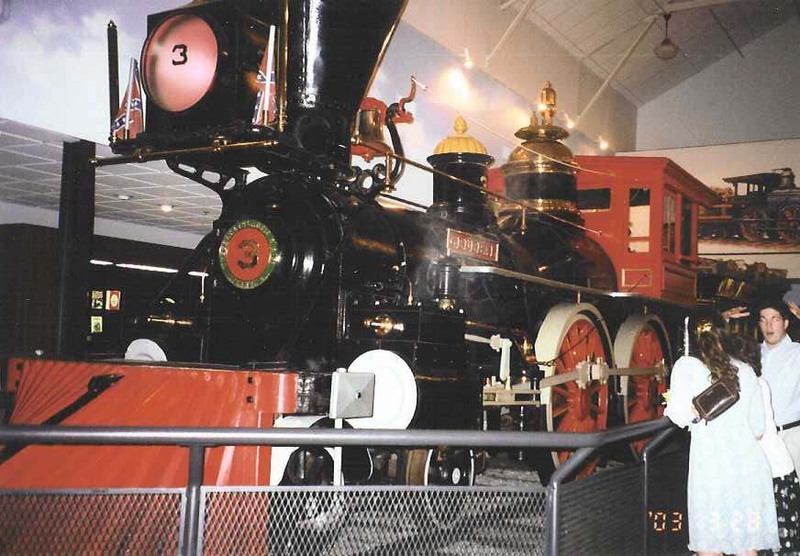 Though Andrews rather brilliantly convinced authorities they were hauling munitions for the defense of Chattanooga, the episode allowed Fuller to catch up, thanks to the Yonah, an engine he commandeered from an ironworks in the town of Etowa. Forced to abandon the Yonah at Kingston, the tireless (and obviously pissed) Fuller pursued the raiders on foot to Adairsville, where he found another, more powerful engine, the Texas, sitting at a southbound siding. Since the General had already passed, Fuller had no time to turn the train around. Undaunted, he went after them with the Texas at full steam in reverse -- still going twice as fast as the General. To Andrews and his men, Fuller must have seemed a man possessed. Each time they stopped to cut a telegraph line or tear up a track, the Texas' smoke loomed into view. Fuller had the Texas going so fast it jumped a three foot section of track the raiders had pried up and kept going. When they uncoupled two boxcars to slow him down, Fuller simply reversed (in this case, forwarded) his engine, gently coupled the cars to the Texas, and sped off again, this time pushing two boxcars in front of him. By this time telegraph messages had reached Chattanooga, and with troops alerted, the fate of the Andrews Raid was sealed. One rebel unit near Dalton observed them parking their last boxcar within a covered bridge and setting it afire in a last desperate try to stop their pursuing demon, the irrepressible Fuller. He was not to be denied, though, as he rammed the burning car full speed, knocking it aside. Soon after the General ran out of fuel, forcing the raiders to abandon it and scatter into the woods. They did not get far, however, for it seemed the entire populations of Tennessee and Georgia were both looking for them, and they were all captured. The raiders were treated as spies, not soldiers, by a court martial that quickly found them guilty of espionage and sentenced them to die by hanging. In military tradition, the execution of soldiers was typically carried out by firing squad, considered a more honorable death than hanging, a fate reserved for the common criminal. Spying, however, is rarely looked upon favorably by any army, as it is deemed underhanded or unfair. Official Confederate records consistently refer to the party not as prisoners of war but engine-stealers and bridge-burners. Only seven of Andrews' Raiders, including James Andrews and our own Marion Ross, died for what became known Great Locomotive Chase. Eight escaped from prison in Atlanta in a daring jailbreak the following October and six (including William Pittenger who authored Daring and Suffering, one of the best known books on the subject) were later exchanged in March 1863 for Confederate prisoners held in Union custody. Pittenger and the five other Raiders released from prison were the first recipients of the Congressional Medal of Honor for their actions. Thirteen other participants later received citations, several awarded posthumously. By his day of reckoning, however, Ross was the only one ready to meet his fate with dignity, and he told Pittenger (who said Ross beamed with a martyr's joy) as he was led away to the scaffold: Tell them at home, if any of you escape, that I died for my country and did not regret it. The other has an Antioch connection. The night before the raid Andrews and his men had spent the night at the Fletcher House, a Marietta hotel owned by a family still loyal to the Union. That is except one member, the daughter Eliza, who according to her mother Louisa (whose diary was published in 1995 and entitled Journal of a Landlady) felt bound to the Southern cause and [was] very vocal in expressing pro-Southern sentiment. Before the war Eliza and Ross had been classmates in the preparatory academy at Antioch College, and Fletcher family history alleges that she received a letter Ross had sent from his prison cell asking if she might speak on his behalf to get his death sentence commuted. Eliza, though, refused to save any Yankee's life, even one she knew from school. Her loyalties to the Confederacy obviously outweighed those to her alma mater. ADDENDUM: Not in original document ROSS, MARION A. 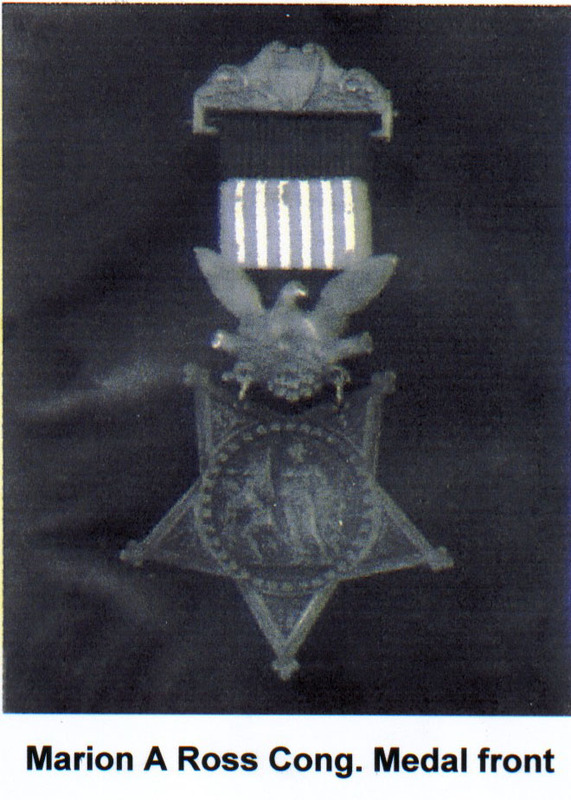 Rank and organization: Sergeant Major, 2d Ohio Infantry. Thanks to my father Arthur J. Plumstead for finding this citation for me!